In Reno, Nevada, a city famous for its casinos, opportunities to gamble abound. But if you don’t enjoy gambling — or you just need a break — here are five things you shouldn’t miss. Grassroots Books stocks new and used books, of course, but also CDs, comic books, movies for all ages, and even kids’ books for 99 cents. Bring a copy of their online coupon offering a free book for every member of your group. 660 E. Grove Street, 775-828-2665, grassrootsbooks.com/home. 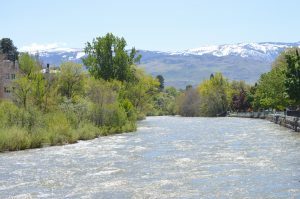 Stroll along the Truckee River Path or take a break to sit and people watch. In the summer, the man-made rapids swirling through the downtown stretch of the river offer a chance to cool off and have some family fun. Park near Arlington Street to access the path. Virginia Street Antique Mall (1251 S. Virginia Street, 775-324-4141) and Somewhere In Time (1313 S. Virginia Street, 775-323-1515, somewhereintimereno.com) are packed full of antiques, collectibles, classic furniture, and interesting artifacts — some of the best shopping in Reno. The National Automobile Museum is a treat for the entire family, showcasing more than 200 classic, vintage, and custom cars. Admission $12 adults. 10 South Lake Street, 775-333-9300, http://www.automuseum.org/. Artists Co-op Gallery of Reno, a gallery for local artisans to display and sell their creations, showcases pottery, paintings, jewelry, baskets, and more. Meet a resident artist and hear his or her story. Don’t miss the back room for monthly themed art. 627 Mill Street, 775-322-8896, http://www.artistsco-opgalleryreno.com/.